• Crystal are cleansed before packaging and sent to you. • Each crystal is Reiki attuned. • I am a Reiki Master/Teacher for two decades. 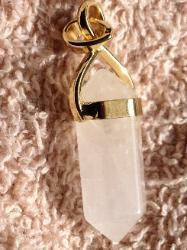 • Pendant is 1 ¼” – 1 ½” approx. • A black satin cord 18” is included with clasp.